Scientists have come to the understanding that eradicating invasive lionfish from the temperate and tropical Western Atlantic is not possible. However, control efforts such as derbies and tournaments have shown great success at reducing invasive lionfish abundance at local scales. 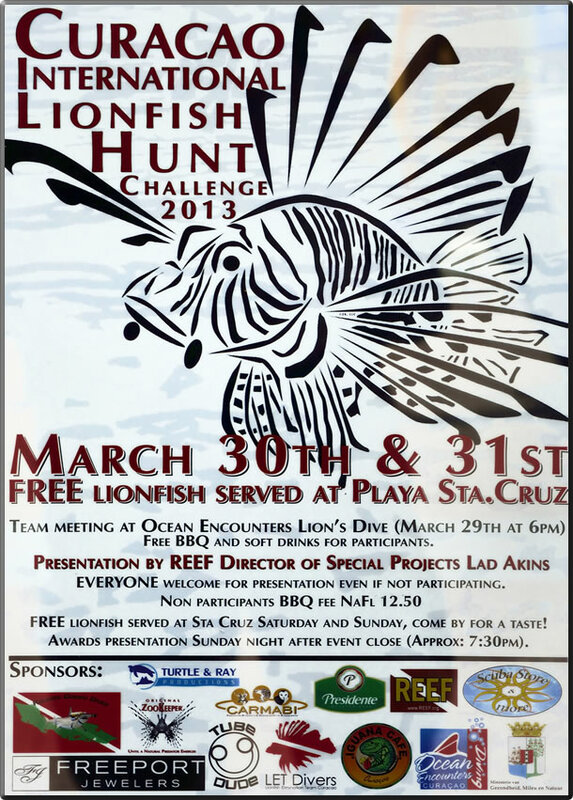 Events like these typically have an educational component, such as a brief talk, followed by removals and then quite often lionfish cook-outs. Inasive lionfish is edible and taste like many other white, flaky fish. As such, removing invasive lionfish not only reduces their abundance at local scales but also puts a healthy, tasty, and green meal on your plate. Invasive lionfish have venomous spines that can inflict a painful wound when stung. It is advised to seek as much training as possible before collecting and handling invasive lionfish. Please refer to the PowerPoint and video for initial training. Sting treatment options are available at the top of the Web Portal Home Page. Harvesting invasive lionfish can be done during recreational activities such as SCUBA diving and snorkeling. This can be done on your own or as part of a derby or tournament. Refer to the calendar for upcoming derbies and tournaments. Refer to Chapter 4 of the Invasive Lionfish Guide to Control and Management for additional information on controlling invasive lionfish through recreational activities. Commercial harvesting of invasive lionfish could prove to be one of the best weapons against the invasion. Below is a synopsis of the current state of the invasive lionfish market. The most effective harvesting method is by spearing while on SCUBA or snorkel. 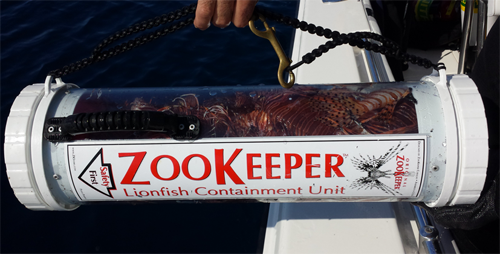 Hand nets are also effective and preferred when targeting live lionfish. Lionfish have been captured in lobster traps but are not the target species. Lionfish have been caught on hook and line but it is rare. Research is needed to create more efficient large scale removal techniques. Refer to Chapter 4 of the Invasive Lionfish Guide to Control and Management for additional information on large scale removal techniques. Below are several end-uses for invasive lionfish. It is very important to be aware of the difference between lionfish and invasive lionfish. Lionfish refers to the populations that inhabit and are native to the Indo-Pacific whereas invasive lionfish refers to the populations found in the western Atlantic, Gulf of Mexico, and Caribbean Sea. Lionfish native to the Indo-Pacific do not impart the same ecological and socioeconomic impacts in their native range as they do in their invaded range. As the invasive lionfish market develops, it is extremely important to be cognizant of where lionfish are supplied from and it is highly encouraged to ask specifically for invasive lionfish. 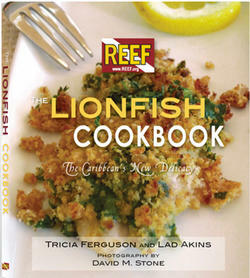 The Lionfish Cookbook is an excellent resource for the most delicious invaisve lionfish recipes. View and vote on all recipes. Enter a lionfish recipe in our contest. Invasive Lionfish parts can be used to make beautiful jewelry and whole invasive lionfish can be taken to a taxidermist and made into stunning pieces of art for offices and homes. Although the aquarium trade and the release of lionfish into the Atlantic is likely the source of the invasion, it is unlikely that the few fish that could be released now would have noticeable impacts. Provided is a list of products to help with control efforts. The creators of the Web Portal do not endorse these items.